Martin Wattenberg is one of my heroes. He's a information visualization guy, and I've been following his stuff for about as long as I've been maintaining this site (that's since 1998...). Even if you're not an infoviz nerd, you've still probably seen his NameVoyager, which shows trends in baby names since 1880. This afternoon, he gave a "distinguished lecture" talk at UC Berkeley, the Social Life of Visualizations. In it, he recapped his greatest hits, and talked about what he found interesting. Here are my (slightlly edited, and hyperlinked) notes. He conducted an experiment. He was curious about vibrations. He took a metal plate, covered it in sand, stroked with violin bow, and saw sand arranges in patterns. Napoleon offered prize to anyone who could explain the pattern. The prize was awarded to mathematician Sophie Germain. The wall is not only an amazing information visualization, it is also effective at bringing people together... "outside" the visualization. Martin has found that his visualizations encouraged conversations. He developed the map of the market at Smart Money. He noticed it would be brought up to start a conversation, to have a conversation. They were looking at Wikipedia, where anyone can mess with any page, and the mystery is that the pages seem pretty good. So they tried to analyze why it should work. There's a mother lode of data... All of the revisions are left on line. For every single change made, you get the text of the change, who changed it, some kind of comment. You represent each version by vertical line. Length of line shows length of document. Connect matching sections across versions. [He then demonstrates this with pages on wikipedia... simple one like the history of IBM. You can read what he talked about here. more complex, like "cat". many more people modified the page. Microsoft has hordes of contributors. Controversial pages get all kinds of traffic... You can "visualize" controversy. Their work demonstrated the vandalism and self-healing properties at Wikipedia. When people would talk about vandalism on wikis, and how quickly the wikis recover, they would refer to the pictures in history flow. Something about showing the pictures that made people believe. the idea is to take words and turn them into buildings. loosely inspired by memory palaces. He shows some interesting apartments. 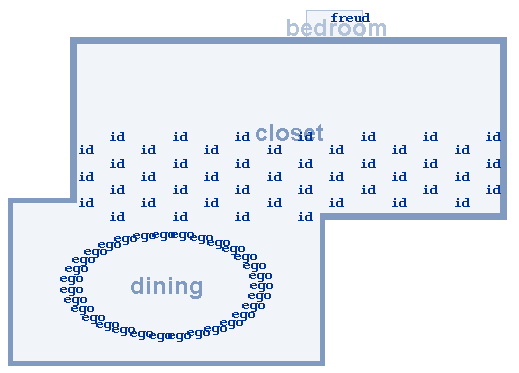 One utilizes the word "id" over and over, the word "ego" over and over" and a single use of the word freud. Try it out to see what happens. They thought the value would be in the art of building rooms. The real value has proven to be the clever ways people manipulate the program to express themselves. In using the program, people recognize patterns... and exploit those patterns. There are feedback loops. When is statistical analysis like a game? Martin's wife published a book on baby names... instead of just etymology, it looks at statistics of name user, gotten from the Social Security Administration. This tool surprisingly became popular. Do a google search on "namevoyager"-- 39,800 results. He went to see what people are talking about. People are talking about it at great length. "find a name that was popular, went away, then came back." And people responded with "grace" and "porter". or, "find the steadiest popular name." What's amazing is that people are proposing complex hypotheses... and are engaged in data mining challenges. There seems to be an analogy with games in what we saw with Namevoyager. Richard Bartle, in writing about MUDs, came up with four types of players. This corresponds to behaviors seen with Namevoyager. -- "this is perfect, as baby names weigh heavily on my mind these days"
-- "runes name doesn't show up at all... but my name has suddenly gotten popular... I HATE IT FIRST! heh"
The success of Namevoyager seems to hinge on the fact that everyone has a point of entry ... everyone types in their own name, or kids name, someone they know. Then there was Q&A, and I didn't take any more notes. Fantastic. Thanks Peter. I am enourmously jealous of you being there! His point about the social worth of interfaces is fascinating, and worth pursuing too - i guess there are overlaps with JSB/Paul Duiguid's social life of information, in terms of the interface as something you can communicate about with others as well as with the computer.